A review of a Flavia book really has to be about two things: the self-contained story within the book, and its place in the overall series, specifically how it forwards the overarching stories and mysteries of the de Luce household. With regard to the latter, the book is wonderful. Alan Bradley’s writing is crisp and witty. 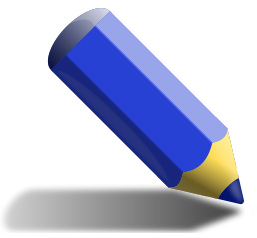 His main character, Flavia, is precocious, with an extra helping of incorrigible on the side. We see the world through her bright, curious perspective, and her voice is incredibly true: it’s really amazing how Bradley, an older Canadian gentleman, so ably and consistently writes her worldly-but-young British voice. And kudos to Bradley too: even though the book is written in the first person, you can pick up on the sense of how very twerpy and little-sisterish she can be at times. Forever tormented by her two older sisters, Shadows is a welcome reprieve from the nastiness Daphne (Daffy) and Ophelia (Feely) got up to in the previous installment, A Red Herring Without Mustard. In Herring, I got the sense that they not only tormented her out of sisterly duty but out of outright hatred, and it was a bit disconcerting. In Shadows, sure, they’re still often awful to their youngest sister, but this is tempered by the fact that, for the first time, we actually see how much Feely cares for Flavia, too. Feely and Daffy are part of the overall series’ mystery: are they just being cruel older sisters, or is there something more there? Does it have to do with the disappearance and death of their mother, Harriet, when Flavia was just a baby? What did really happen to Harriet? I had hoped to hear more about that in this book. Harriet, though dead (or at least missing in action these last ten years), is nevertheless one of the series’ main characters. She’s referred to often by the de Luce family, and Flavia thinks about her continually (interestingly never calling her anything but “Harriet” in her mind or out loud). It’s really quite tragic, heartwarming while also heartbreaking, to see how this child, left without her mother and without a particularly engaged father, copes. She prides herself on having Harriet’s fine sense of hearing, and when she needs to think she retires to Harriet’s Rolls Royce, which is kept in the carriage house but never used. We always get a wonderful cast in every Flavia book, be they murderous philatelists, puppeteers, gypsies, or, as is the case here, ciné folk. In Shadows, Buckshaw (the de Luce ancestral home) is being rented out by a film crew, including a famous director and his two famous actors, and their coterie, in order to help Flavia’s father cope with his chronic money problems. We also get to see some of the luminous and quirky cast from previous books, including the Misses Puddock, “two creaking relics…who had managed to insinuate themselves into every public performance in Bishop’s Lacey since the year dot”; Dogger, the reliable house man who is tormented by his past as a prisoner of war, and who is Flavia’s dearest friend; and Inspector Hewitt, the lead police officer on all of Flavia’s mysteries. Hewitt strikes a great balance between antagonist and mentor, half-exasperated at Flavia’s involvement in these murders, half-amazed by her insights. And this book doesn’t disappoint as its characters grow, develop, and interact with one another. We also get to know Aunt Felicity better and learn some rather interesting secrets about several characters’ pasts, particularly during the war. With regard to the self-contained plot: while there is much to love about the overall series, I found myself quite disappointed by Shadows. I did love Flavia’s devious plan to use chemistry to capture Father Christmas and prove his existence once and for all—it’s so funny and so very Flavia. But the murder mystery itself is slight: the murder doesn’t happen until page 127, which leaves just over half the book to deal with the discovery, the calling of the police, the search for clues and suspects, and the final confrontation. The plot is constrained by its setting: half the village plus the ciné crew are snowed in at Bishop’s Lacey the day before and the day of Christmas Eve. This makes for an understandably limited scope—there are only so many places to go within the house itself, and only a couple of days for all of the action to occur. We don’t even have the luxury, since it’s a snowstorm in December, of following Flavia into the village and out into the countryside beyond. This is one of the problems of a longstanding series that takes place during roughly the same time and in roughly the same space. Buckshaw is dear, and wonderful to come back to as a reader, but it’s also a bit tiring when it’s the only place we get to see in this book. I’d like to see Flavia in London, or in school, or even taking a part-time job in one of the village’s shops. Because of this constrained nature, too many false clues abound, without enough time to spin them out to get you really invested in believing the best or worst about any particular character. What was the point of McNulty’s accident? Why spend so much time with Bun Keats? What was going on with Anthony the driver? What is Nialla doing there at all? I was surprised to find myself on the roof so quickly with the killer, and while the Father Christmas trap is a fantastic sub-plot, the use of Flavia’s birdlime to catch the killer felt too much like a deus ex machina for me—in fact, the moment she started laying out her trap for Father Christmas, I already knew that it would factor into the plot’s denouement. This is out of place for Bradley, whose plots and traps are usually more subtly woven than this. As well, the discovery that one book, which has been on the shelves of Buckshaw for generations, is actually an original Shakespeare Quarto, and that it will solve all of the de Luces’ money problems, also reads too easily to me. I would have found it far more interesting (though terribly sad) if the de Luces were forced to leave Buckshaw, or rent out part of it to new tenants, than simply to come into millions of pounds by accident. The ending had me leafing back through to see if I’d missed a chapter or two inadvertently—not because it didn’t make sense, but because it just felt so rushed and too easy a tie-up for a murder mystery. 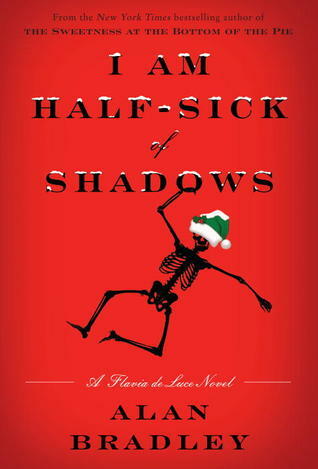 With A Red Herring Without Mustard debuting just over half a year before this one, I’m left wondering if I Am Half-Sick of Shadows was rushed into production to come out just in time as a Christmas title. Overall, the book is worth reading. It’s charming and it feels like visiting old friends. It’s great to spend time in Flavia’s company. I just wanted more from the book’s self-contained plot. The mystery needed to be deeper and more complex than it was. Still, the style is delightful and the characters are well crafted. If you’ve yet to read a Flavia book, do yourself a favour and start at the beginning. You’ll then be immersed enough in the world of Bishop’s Lacey to forgive individual plot shortcomings. And, like me, you’ll still find yourself eagerly anticipating the next installment (Seeds of Antiquity). I Am Half-Sick of Shadows, by Alan Bradley, published in Canada by Doubleday, © 2011. Available at the Random House site, Amazon.ca, Indigo, and fine independent bookstores everywhere. Dee, and I mean this with the deepest respect: Please, please stop reviewing fantastic-sounding books. I simply can’t afford to keep up with all the stuff you recommend I read! Review something awful next, kindly, so I can feel good about not reading it at all! Thanks Marc 🙂 You really should read this series. They’re quick reads and a lot of fun!